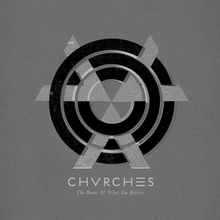 Scottish synth band Chvrches’s first studio album, The Bones of What You Believe, is an energetic bubbly adventure filled with 80’s-style beats that give the album a futuristic vibe. The compressed bass drum, a technique usually used in dance music, bounces along while shimmering synths and vocals drone over it and come together in a waterfall of sound. The overall effect is an album that sounds like it could be a close relative of The Naked and Famous’s Passive Me, Aggressive You. Mayberry’s vocals are soft, childish, and just the right range to smoothly blend right into the synths. It’s the kind of voice that resembles the high-pitched sting of a toy piano, yet it manages to remain pleasant and poppy, no matter how long you leave the album on repeat. The album’s opener, “The Mother We Share,” immediately invites listeners to shoulder roll shyly in a Flashdance boatneck sweater. Mayberry’s hopeful vocals sing of a shared burden and wisdom of hardships to come, using her voice as just another instrument. Layered ohs are panned in such a way that they chase each other through the melody, blending with the other themes. “Recover” plays off of this same vibe, adding pixilated echoes and a megaphone sound to the mix. “Under the Tide” and “You Caught the Light” both feature lead vocals by Doherty. Other than Doherty’s participation in both songs, they’re quite different. “Under the Tide” is much lighter and happier than the theme of the lyrics. “You Caught the Light” takes things and slows them down to a much more tranquil pace, gliding like fluttering snowflakes. The song dies down until eventually it’s simply the beat, a glacier-paced drone, and Doherty’s voice. Along the same lines is “Tether.” A cave-like atmosphere is set with the echo of the vocals and a period of sounds similar to water dripping from stalactites. The background is full of muted chants and electric charged beats. The track list leads from a racing pop beat to a slower, serene murmur and back again. Between the different synths used, the variance in vocals, and the blending of both elements, Chvrches created a miniature repertoire of sounds, jumbling them up in a way that maps out a flowing fourty-eight minutes of playful, spirited techno beats accented with a cascade of synths and timid vocals.